← Treat Yourself With Brownie a La Mode and Be Dazzled! Some people don’t only visit a coffee bar in Texas to grab a cup of coffee and indulge in the benefits of caffeine. They also like to do other things, like reading a newspaper or book, burying themselves in their laptop, studying, or spending quality time with friends. If you’re the type of person who wants to go out but likes a cozy place where you can read a cup of coffee and read a book from your favorite author in peace, a coffee bar is the right place for you. In a coffee bar, customers are likely to mind their own business. They do the same thing you do: drinking coffee and getting preoccupied with another activity. As a result, you can read something and enjoy your drink at the same time without getting disturbed by others. A coffee bar is an excellent place if you need to work on something with your laptop, such as answering your work emails, designing, and so on. Although libraries are quieter than a coffee bar, you’re not allowed to eat or drink in the former. In a coffee place, you can drink coffee and eat desserts while you get busy with your laptop. If you’re a student and you want to study for an exam somewhere where you can pick on desserts to relieve your stress, then our coffee and dessert bar in Texas is the best place for you. We serve decadent cakes that will surely keep your mind active. If you want to spend more time with your friends after a long day of shopping, you can all acquaint yourselves in a dessert bar in Sugar Land, Texas where you can grab your favorite coffee or smoothie, order sweet desserts, and relax. It’s also a perfect place to take photos of your hangout. 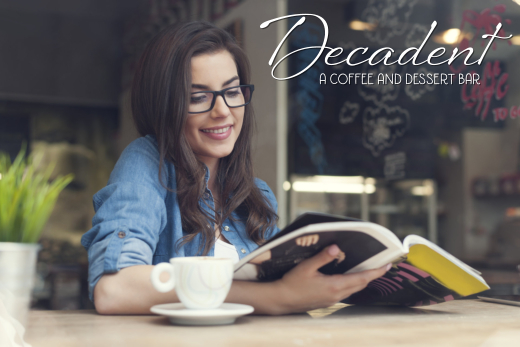 Visit Decadent Dessert Bar today! This entry was posted in Coffee Bar and tagged Coffee Place, Decadent Cakes, Drinking Coffee, Eat Desserts. Bookmark the permalink.